One of the most important aspects of maintaining the highest standard of dental care is the regular attendance of continuing education courses and national conferences. Our experienced dentist, Michael Fulbright, DDS, is firmly committed to staying abreast of the latest techniques in dental care to provide our patients with advanced, effective treatments that can successfully renew both the health and appearance of their smile. 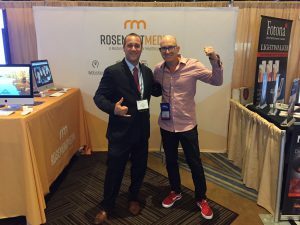 With that in mind, Dr. Fulbright and members of his team here at Fulbright Cosmetic & Reconstructive Dentistry regularly take part in annual conferences and symposia, and recently returned from two of the most important gatherings of dental professionals in the world. 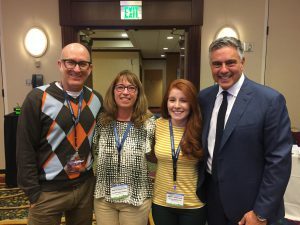 At the American Academy for Oral Systemic Health’s 2017 Scientific Session in Salt Lake City, Dr. Fulbright and some of our staff members got to meet and hear from numerous other dental professionals about a range of topics relating to oral systemic health and the mouth-body connection. In fact, our practice’s new consultant, Gari Kadi, was a speaker at the AAOSH conference. Attention to oral systemic health is a very important part of our practice, and we were thrilled to discuss some of the latest research and techniques with others from across the country. Dr. Fulbright also recently attended the 66th American Academy of Implant Dentistry Annual Conference held in San Diego. When it comes to dental implants, our practice prides itself on offering state-of-the-art options for patients with missing teeth. The AAID conference makes it possible for Dr. Fulbright to participate in a number of seminars, workshops, training sessions, and clinical presentations detailing new and exciting developments in implant dentistry. Our entire team is dedicated to the continued advancement of dentistry and to adopting new techniques that improve upon the old, allowing our patients to attain the most effective and comfortable care possible. If you would like to learn more about the procedures available at our practice, or if you are ready to schedule an appointment, please contact Fulbright Cosmetic & Reconstructive Dentistry today.